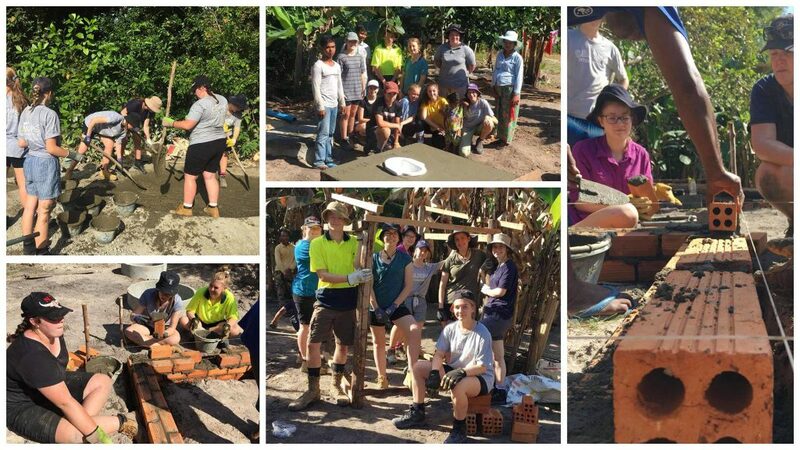 A group of students and staff have traveled to Cambodia with Camps International for a 15 day adventure, with the group departing on December 5th and returning on December 20th. Follow their journey on this page with regular updates. Today we visited Angkor Wat – The Most Ancient Seven Wonders of The World, the Bayon – The temple of faces and Ta Prohm aka the ‘Tomb Raider Temple’. The Bayon Temple’s symmetry was amazing with each gate a mirror image of the next. We had to fight our way through the crowds but were rewarded with a photo nose to nose with a carving of Buddha. The Tomb Raider Temple has its name as this is where part of the original Lara Croft film was shot. We found the spot, got our cheesy snap and the teacher reminisced about the game. And finally Angkor Wat. Our photos speak for themselves and our descriptions are filled with adjectives. The stairs were not a highlight but getting to the top was. If you ever get the chance to come to see these amazing sites for yourself do it. And you get to tick off an Ancient Wonder too. Stay tuned for more adventures as we head back to camp tomorrow and another project. 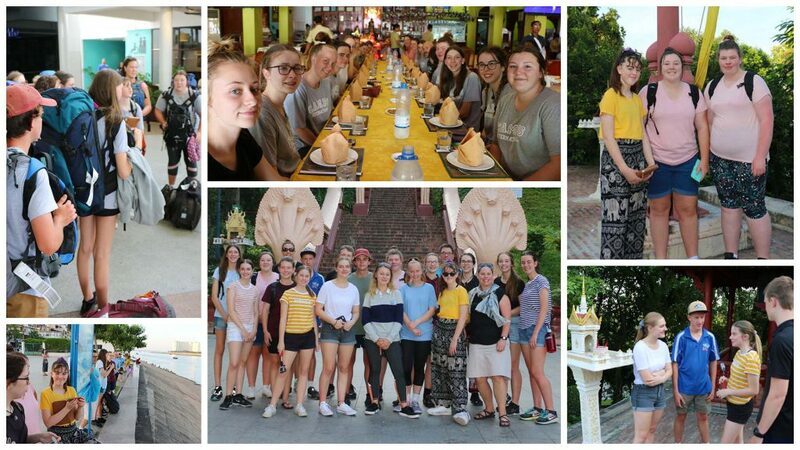 After being in the camp for a few days we have been pampered in style with a fancy hotel, buffet breakfast and a pool! Siem Reap is completely different to phnom Penh, It has a more laid back culture and the shopping is amazing. The locals are pretty talented too. With their intricate craftsmanship and tools, it is mind blowing to watch. The performing arts are pretty good too, with the circus a giggle. No food goals today, but aerobatics at the circus kept us on the edge of our seats. Camp Beng Pae has been our home for the past few days and nights. And with no WiFi our update just had to wait. Our accommodation has been simple, with a mat, pillow and of course a mozzie net, all we really needed after a day working on a project, well that and a shower. The food has been amazing and we can all cook eggs now (well at least scrambled, fried or an omelette), and the cooks have been amazing. The spag bol was different to what mum makes, but you can ask us about that in person. Now to our project work and the reason that we went on this trip. Day 1 of the project saw us making concreate rings that we would need the next day. We can’t remember how many rings we made but we can sure tell you the quantity of sand, gravel and cement needed to make a batch of the grey gloop. Day 2 saw us split into two teams (yes we have names but you’ll have to ask us about them when we get back) and then we started digging. Our project for the next three days was to build a toilet for two families, complete with a septic tank. Hence the digging. The goal was to dig 1.3 metres, but depending on our team the goal this was a little different. Regardless, 4 holes in total were dug and then the concrete rings were slid into place, not too bad for day 2. Day 3 saw us try our skills as brickies, and let’s just say some of us are better at it than others, best not to mention names here, but the results may surprise you. Day 4 saw us render the outside of the wall and fill the bricked box with concrete. A different consistency this time, but it did the job. And then we were done. Well once the bowl was in place. Proud of our efforts we took the afternoon off and taught the locals how to play cricket with some gear we made out of some leftover wood from the worksite. We have been on an emotional roller coaster today with ups and downs. But lets start with the Royal Palace. No we didn’t see the king, but he was there too today, and he has a pretty nice work environment with even a silver Pagoda to worship in. In the temple we had to take our shoes off and weren’t allowed to take photos once inside. It was surrounded by amazing gardens and ornate buildings as far as the eye could see which always gave us something to look at. Our rollercoaster then started to head down as we visited the museum at S21, a former school. This was a somber reminder of people are capable of. Depending on your perspective it was either a late flight or a very early one, regardless we have all arrived safely. 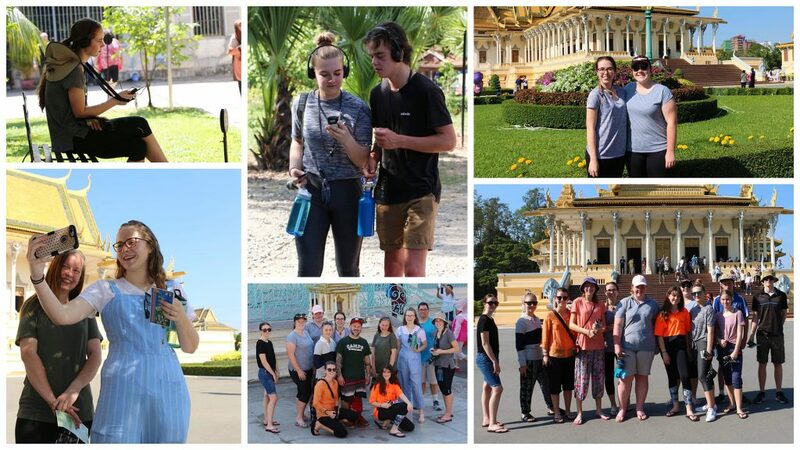 Today has seen our group (17 students and 3 staff) get out and about in Phnom Penh. First we checked out the man made hill with a Buddhist Temple otherwise known as “Wat Phnom”. We also started to get a taste for what life might be like for typical Khmer people, with many students remarking on the road rules or what would appear lack of.